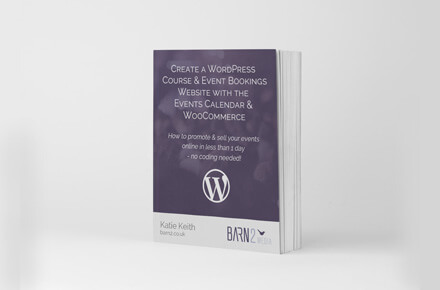 We have published a WordPress WooCommerce Event Bookings Ebook to accompany our online course ‘Build a Course & Event Bookings Website with WordPress‘. The ebook will be available free of charge from 28 – 31 July 2016, for a limited time only ($4.99 thereafter). Grab it now! 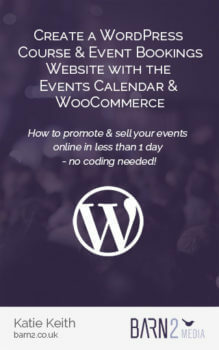 I’ve written it to teach people how to build a fully functional WooCommerce events website using popular The Events Calendar and WooCommerce plugins. You might want to display non-bookable events, take bookings for free events or take paid event bookings with e-commerce. Whatever your needs, the ebook takes you through the process from start to finish. What will I learn from the ebook? The Kindle ebook is for WordPress users who have some WordPress experience but are not experts. You don’t need to be super-technical and you don’t need to know how to code. You don’t need to have used WooCommerce or The Events Calendar before. The techniques I’m going to teach you don’t require any coding at all – you will set up your WooCommerce events site by learning how to use existing plugins. Most of the plugins featured in the ebook are free. If you need to take paid bookings for your events then you’ll need to be willing to purchase the Event Tickets Plus plugin. This is needed in order to use WooCommerce for event bookings. What isn’t covered in the ebook? The purpose of the ebook is to teach you how to create an events website and take bookings online with WooCommerce and The Events Calendar. I’ve tried to keep it as simple as possible for you while providing everything you need to create an effective website. Courses which take place directly on your website, e.g. online courses, LMS or webinars. The ebook is suitable for you if you want to promote or sell places on online courses which will take place outside of the website. For example I will teach you how to create a website to sell places on your webinars. However I won’t tell you how to set up a webinar. The ebook is about how to display and sell places on your events, not how to provide the actual events. Very basic WordPress knowledge – How to install WordPress, how to create pages and posts, etc. Although I will give you some more general tips, you are expected to know the basics of setting up a WordPress website. More advanced technical customisation of the plugins covered in the ebook. For example I’ll tell you how to style your events using the built-in stylesheets. But I won’t tell you how to customise your templates by changing the code. Advanced tips and techniques – If you’d like to learn more about how to increase the revenue from your events website then I recommend signing up for the online course that accompanies the ebook. It contains extra materials including how to earn more money by cross-promoting your events with other types of product and time-saving techniques to add multiple events more quickly. The e-book also covers how to test your events site and make sure everything’s working correctly, and how to troubleshoot and fix any problems with your events site. It contains videos showing me create my own events site step-by-step, which bring the written instructions in the ebook to life. The ebook and online course work perfectly together. I am giving away the Kindle ebook for free from 28 – 31 July. After this, the price will be $4.99 – which is still a pretty amazing deal! On top of that, if you buy the ebook then you get a $10 discount off the online course. So what are you waiting for?! The E-Book is available on all the Amazon sites. Please click on one of the links below to get it from your local Amazon store. Download it to any Kindle device now (or download the Kindle app to your phone or computer now – it’s available for nearly all devices whether you’re on Android, iOS etc.). Once you’ve done that, you’ll be ready to start creating a fantastic WordPress course and events booking website with WooCommerce.